Posted September 13, 2018 by K.C. Hopson & filed under Event Rebels Blog, Meetings Technology, Resources Reverse Trade Show, Trade Show, What's New. As attendee demand for a more personalized experience continues to grow, more and more event and meeting planners are turning to the reverse trade show model. 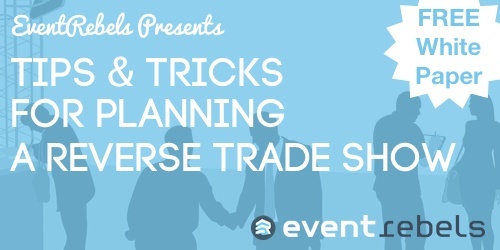 We’ve taken all of our tips and tricks for planning a successful reverse trade show and compiled them in an easy-to-read white paper just for you. What’s the difference between a reverse trade show, flipped marketplace, and hosted buyer model? How can you best prepare your reverse trade show?